Hey there fellow “bugged out preppers!” I was recently contacted by a representative of Smith’s Products asking if I could review some of their products. How cool is that? I said yes of course, and they even suggested we give away 1 of each of the products I review to one lucky person. More on how to be entered in the contest later. 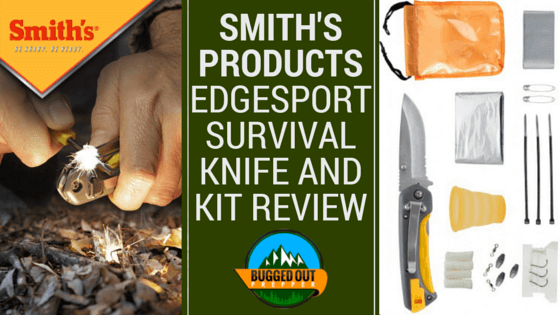 The first of 5 reviews is the Edgesport Survival Knife and Kit from Smith’s Products. I started with this survival kit because it is one of their smaller kits and costs only $39.99 (as of 06/23/2015). This is a small, yet useful survival kit and should not be confused for a full out bug out bag. It doesn’t come close. However, it is great for someone who is out hiking or biking through the woods. This kit is listed as an 11 piece survival kit, but came with a few more items if you count the whistle that is attached to the fire starter, or the signal mirror that was in kit, but not one of the listed items. I’ll list everything included below in the features section, and I will elaborate on a few of the key features. I will also elaborate on one of the shortcomings of the kit. While reviewing the Edgesport Survival Knife and Kit, I first grabbed hold of the knife. I bet all of you would have done the same thing. It came out of the packaging very sharp. I was easily able to shave off the hair on my arm without needing to use the diamond sharpening rod which stores inside the knife handle. The knife blade is made of 440A stainless steel which is highly rust resistant, so no need to worry about rust. However, 440A steel is a low cost stainless steel which may become evident with a lot of use. The handle is made of plastic, but doesn’t feel cheap. Rather, it feels really comfortable with the soft grip. While using the knife, the locking mechanism was reliable and I felt safe using this knife for a variety of tasks. Hidden within the knife handle are three other tools. One, which I mentioned earlier, is the diamond sharpening rod. Also included is a fire starter rod with a whistle attached to the end. After getting the black protective coating off the fire starter, it sparked really well. I will have a video up later showing how I made a fire using this kit. All the items in the survival kit fit nicely within the orange pouch. It is described as being water resistant which it is, but it can be improved. One really critical aspect of the container is that it does not have zipper or any way to seal it. The top stays open leaving space for water to enter. I was able to fold the top over and then connect the clips. While this does close off the top it deforms the container a bit and doesn’t really resemble the image. The clear front cover is handy to identifying what you have packed and does a good job repelling water. The open top isn’t a huge problem but if you anticipate being around water I suggest moving the contents into a water-proof bag. Not only does Smith’s Products pack the kit with useful items for survival, they also include a one page survival guide to keep with the kit that will help you use the kit in a survival situation. Leave an itinerary and map of where you will be staying with someone. This particular survival kit comes with about 3 feet of duct tape which is decent for a starter kit, but may not be enough for a long term survival situation. Keep in mind this kit is not designed to survive an Apocalypse. So, if you think you will need more than 3 feet, go ahead and pack some extra. There are countless uses for duct tape, from fixing clothes, shoes or building a shelter. You will will be happy it’s there when you need it. The guide also covers the basics of first aid, building a shelter, signaling for help, finding a water source, and locating food. Using the tips in the survival guide will greatly increase your chance of survival. Just don’t forget it’s in there though. Overall, this survival kit packs a big punch for being so small. The fire starter and tinder’s enable you to create and maintain a fire quickly in the event of a survival situation. Hey, you may even get to use the fishing kit to catch some fish and cook over your fire. Then while you’re at it, why not use the collapsible cup to wash down your fresh fish with some water you found using the tips in the survival guide. All joking aside, Smith’s Products Edgesport Survival Knife and Kit provides the avid outdoorsman a compact and lightweight kit to bring along to safeguard against an emergency or survival situation. 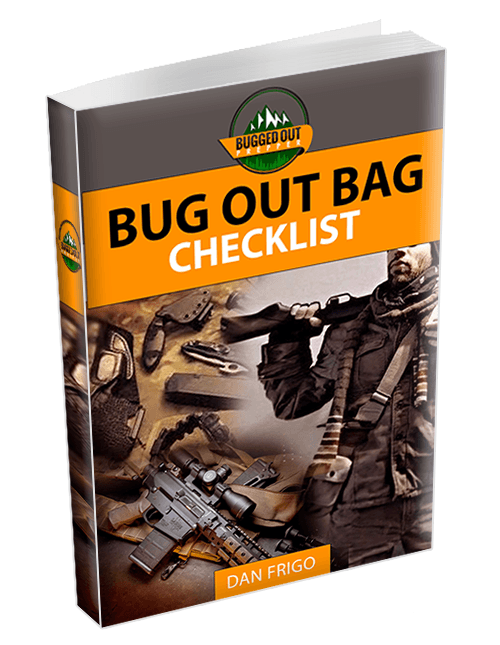 While it is not a replacement for a bug out bag, it definitely has a place for hikers and other outdoors-man who need something that provides the essentials for survival.